voilà des idées en plus pour alimenter le sujet sur NOTRE marvel land..
ça fait quand même un bout de temps que la "rumeur" de ce Marvel Land circule. Cela fait effectivement trois ou quatre ans que Mice Chat en parle et Bob Iger l'a confirmé l'année dernière lors de la D23 Expo 2017. 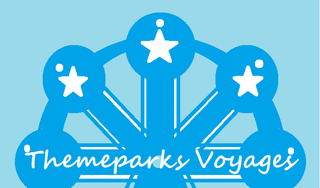 Cela avait été repris le jour même (le 15 juillet 2017) sur le blog officiel de Disney Parks and Resorts (et, avec le décalage horaire, relayé le lendemain sur DCP). Juste un petit peu dommage car c’était vraiment une exclusivité (est ce que Bug’s Life est encore populaire ?). Le parc manque de place alors bon débarras. It's tough to be a bug était quand même très fun. Mais c'est vrai que la salle était généralement vide. La question, c'est est-ce qu'ils vont seulement récupérer l'espace de Bug's Land ou bien aussi le parking qui est derrière ? Parce que là, il y a vraiment de quoi construire un très gros land ! Il serait plus logique de développer vers le parking que d'aller vers la zone Monsters, ce qui obligerait de traverser le Hollywood Boulevard, de rethématiser l'Hypérion, etc. Je pense comme toi Freddy, il y a de fortes chances que le passage entre TOT, Cars et Bugs soit ouvert et Marvel prolongé sur une bonne partie du parking. Ceci étant dit, on ne sait pas à qui ou à quoi sert ce parking et les bâtiments qui s'y trouvent. Cette parcelle est également la dernière de "libre" pour DCA, le parc étant entouré de boulevards et d'hôtels. Pareil pour le Disneyland Park d'ailleurs qui est arrivé au maximum des extensions possibles. Encore une très belle extension à venir en tous les cas. Vous pensez que il "risque" d'avoir une rethéma de Monster inc ? Mais comme le souligne Mr.Freddy cela impliquerait une rethéma de l'Hyperion (donc perspective du Hollywood Boulevard complètement détruite) puis le land semble s'étendre du coté de A Bug's Land donc l'utilisation du parking restant semble plus logique. Même si comme le dit Mr Toad c'est l'un des derniers (voir le dernier ?) espace libre pour une extension de DCA. Après un udapte ou une rethéma sur un autre thème autre que Marvel peut très bien être envisageable pour Monster Inc., mais bon ça ne me semble pas la priorité majeure pour DCA. 2020 la nouvelle zone? Mais il peut pas y avoir de nouveaux rides de construits en si peu de temps? Si ils bossent dessus depuis quelques temps et que tout est prêt à être mis en construction ,oui . A Bug's Land est encore ouvert; pour dans 2 ans ça me semble quand même chaud à moins d'avoir quelque-chose de "rapide" à construire. Je suis passé à côté de cette annonce et suis vraiment enthousiaste. Je pense aussi que l'extension ce fera côté parking car j'imagine mal la destruction de la perspective de Hollywood Boulevard. Comme le dit Freddy, le parc sera vraiment à pleine maturité et il ne sera plus nécessaire de lui apporter rapidement des nouveautés ensuite. La qualité immersive et thématique sera vraiment excellente partout. Sauf la partie "Backlot" de Hollywoodland ou on trouve le ride Monsters Inc. Il y a pas mal d'années maintenant on parlait du'une zone Monstropolis qui n'a finalement jamais vu le jour. C'est vraiment l'endroit qu'il faudrait revoir mais il serait dommage d'enlever Monsters Inc qui reste un dark ride bien sympathique. Several aging toddler attractions at Disney California Adventure Park could be bulldozed in the next year or so to make way for an expansion based on some of the world's most popular fictional characters. 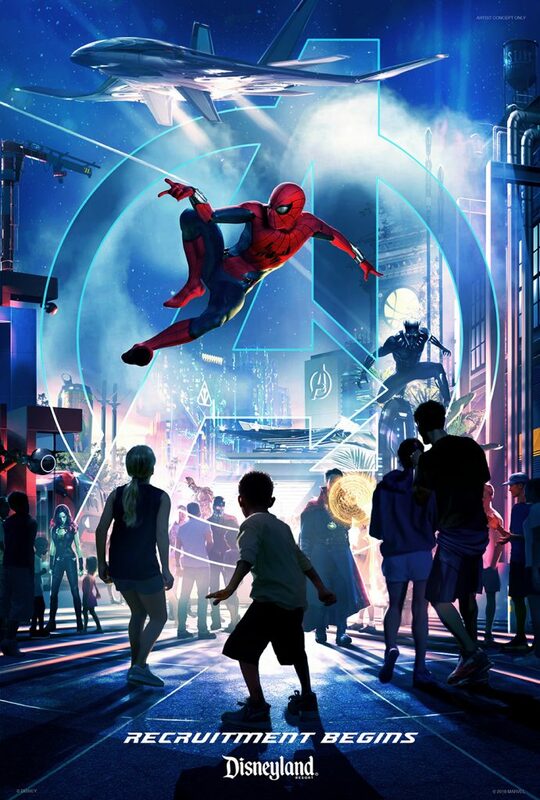 The new land in Anaheim will feature superheroes made famous in Marvel comic books, movies and video games, including Spider-Man, the Hulk and Iron man, among others. But don't expect the Walt Disney Co.'s latest theme park attraction to be called "Marvel Land" — a title that would capture the wide cast of warriors in the comic publisher's universe. 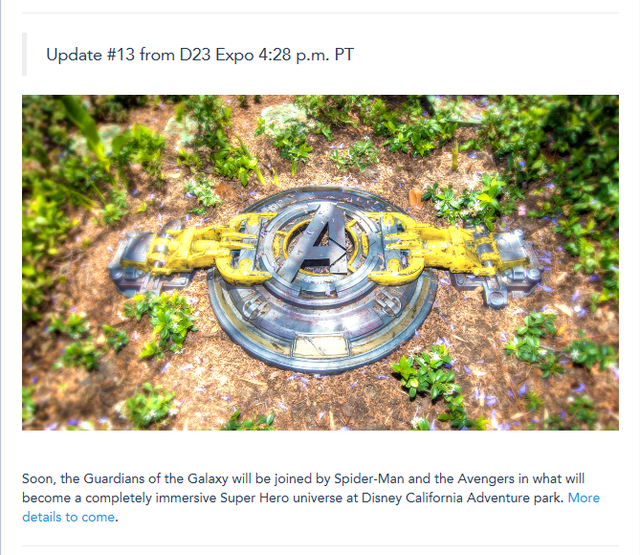 Instead, it might be dubbed "Avenger Land," "Super Hero" hub, or some such variation. Blame it all on fine print. Marvel Entertainment was purchased by Disney in 2009, but still must follow licensing agreements with other movie studios — as well as to Disney's biggest theme park rival, Universal Studios — that impose limits on the Burbank media and entertainment company's intellectual property rights. Specifically, they prohibit Disney from using a few specific Marvel characters in Disney theme parks east of the Mississippi River and ban the Mouse House from using the word "Marvel" in the title of any theme park land elsewhere. The agreement was drawn up nearly a quarter-century ago when Marvel, Disney and other Hollywood studios could only dream of how successful the superhero franchises would become. But that has all changed. Disney has grossed nearly $3 billion in worldwide revenue from its last three Marvel superhero movies alone: "Black Panther," "Guardians of the Galaxy Vol. 2" and "Thor: Ragnarok." And the X-Men — based on characters created at Marvel — have generated more than $2 billion in gross box office revenues for 20th Century Fox, which owns the movie rights to the characters. The Spider-Man films also spun out more than $2 billion in box office revenue for its film licensing rights owners, Sony. Still, Robert Niles, editor of the online blog Themeparkinsider.com., said that neither Disney nor Universal Studios are likely to violate the agreement and risk an expensive court battle. "If Disney is proceeding with something, I would be astonished if they didn't already make sure they were cleared to use those rights," he said. Disney officials declined to comment on the licensing agreement but said the deal won't derail their plans to build an expansion that will resonate with fans. "We are excited to bring these stories and their compelling characters to life with a new land in Disney California Adventure park," said Disney spokeswoman Suzi Brown. Disney officials have offered almost no details about the new superhero land it plans to open in 2020, except to say that the expansion will be anchored by Guardians of the Galaxy — Mission Breakout, an attraction at the California Adventure Park that was overhauled to include a Marvel theme last year. 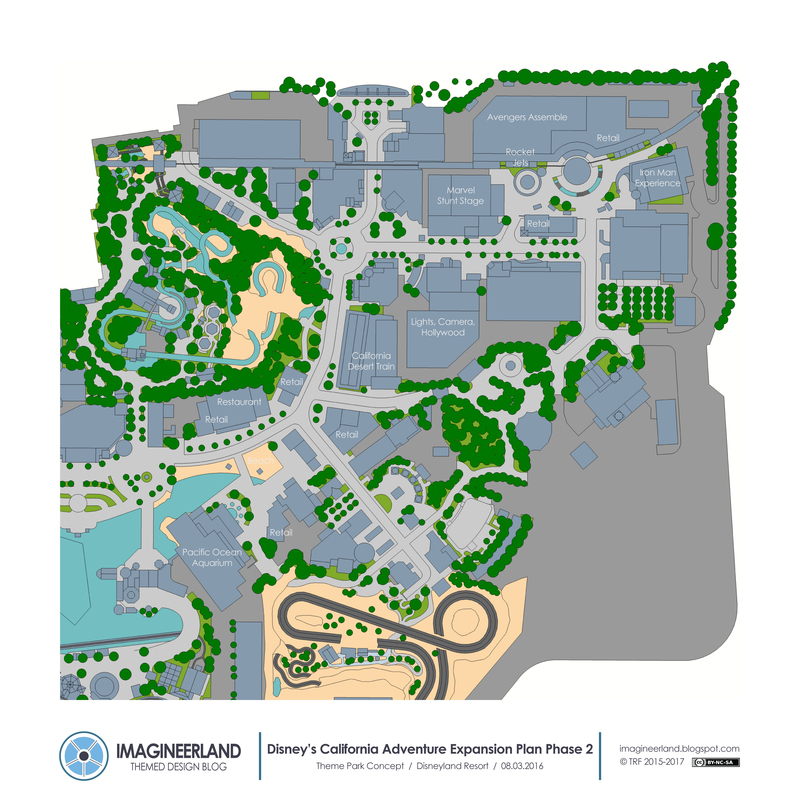 Theme park experts think the expansion will take over parts of a nearby employee parking lot and a portion, if not all, of A Bug's Land, a nearby area geared to young children and toddlers. The name decision is governed by a 1994 licensing agreement between Marvel Entertainment and MCA Inc. that also spells out how Marvel characters can be used by other theme park operators. MCA is the predecessor company of NBCUniversal, parent of the firm that owns Universal Studios Hollywood and that is the third-largest theme park operator in the world. The deal — whose financial terms have been stricken from a version filed with the Securities and Exchange Commission — originally gave MCA the rights to use Marvel characters in Universal Studios theme parks around the world but only if Universal exercised those rights. Within the U.S., the Mississippi River plays a key demarcation role in the agreement: Universal could have locked down the rights to use Marvel characters in its parks across the country if the theme park company had built Marvel attractions on both sides of the Mississippi River. But Universal did not. Instead, the company only added Marvel attractions at Islands of Adventure at Universal Studios Orlando in 1998, freeing up the rights to Marvel characters for other theme park operators west of the river. But the Marvel licensing agreement has a few more twists: The rights to specific characters that are not used by Universal Studios Orlando were free to be sold to other theme parks east of the Mississippi River — such as Walt Disney World. The agreement defines those characters "in use" at Universal Studios as those superheroes that are "more than an incidental element of an attraction." Further complicating the matter is the issue of "superhero families." The agreement says that if Universal Studios Orlando uses a character that is a member of a superhero family, such as the Fantastic Four or the Avengers, no other park can buy the rights to other members of that same superhero family. Even villains of a superhero featured at Universal Studios Orlando cannot be used by other parks east of the Mississippi. At Islands of Adventure, guests can meet and take photos with actors dressed as Captain America, Wolverine, Storm, Green Goblin and Dr. Doom. They can also ride a roller coaster with an Incredible Hulk theme, an indoor simulator ride featuring Spider-Man, a spinning ride called the Storm Force Accelatron and a free-fall attraction known as Doctor Doom's Fearfall. A representative for Universal Studios Orlando declined to discuss the Marvel rights agreement. As a result, Walt Disney World in Florida cannot even feature Spider-Man's arch enemies, like the Sandman or Dr. Otto Octavius. "It's an agreement upon an agreement upon an agreement," said Jim Hill, a Disney historian who produces a blog post and a podcast about the company. However, Universal Studios Orlando does not feature the Marvel characters from the Guardians of the Galaxy movies. That explains why Disney plans to build a roller coaster at its Epcot theme park in Florida that features the Guardians of the Galaxy characters. Hill noted that the licensing agreement came into play in 2012 when Disney decided to promote its Avengers superhero movie by plastering a monorail at Walt Disney World in Florida with giant images of the Marvel heroes on the sides of the train. But the so-called Avengorail only ran on a set of tracks outside of the theme park so that the promotional gimmick would not violate the licensing agreement that banned the Marvel characters from being used in other theme parks east of the Mississippi, he said. Meanwhile in California, Disney faces only one major licensing obstacle when it builds its new superhero expansion at California Adventure. The agreement says that regardless of which side of the Mississippi River a theme park is located, "Marvel may not permit a licensee to use the name 'Marvel' as part of the attraction name or marketing." That explains why Disney announced its plans for a superhero land without mentioning the word "Marvel" in its press statements. Instead, the park announced that "The Guardians of the Galaxy will be joined by Spider-Man and the Avengers in what will become a completely immersive Super Hero universe." Some theme park experts say all the fine-print restrictions are just that — and visitors to the new California Adventure land probably won't notice or care if it doesn't include "Marvel" in its name. "I don't think the average Disney guest will overthink it," said Martin Lewison, a theme park expert and business management professor at Farmingdale State College in New York. "If they can call it Avenger's Land, that's a pretty good substitute for Marvel Land." Los Angeles Times - 6 avril 2018. Comme c'est regrettable... ou pas ! Vous ne pensez pas que le futur land Marvel va aussi se développer dans la zone Hollywoodland? De nombreux bâtiments à côté du ride Monstres & Cie semblent inutilisés ou sous exploités (point photo avec les perso Marvel, salle de diffusion des courts métrage Pixar).